At the end of the day, BigApps participants celebrated the near conclusion of the competition with the first ever Demo Night. In front of a panel of esteemed judges, 11 BigApps projects demoed fully functionally projects and four four honors were awarded. This event was generously hosted and supported by New York Law School and Code For America’s Brigade. A big thank you to Personal Democracy Media in supporting NYC BigApps Demo Night winners. NYC BigApps 2013 ends on Friday, 7 June 2013 at 5:00 PM and is open to all! Good luck NYC BigApps participants and submit your app today! App Description: HealthyOut is a smart meal recommender that allows New Yorkers to quickly locate healthy meals at local restaurants. With a few simple clicks, users can search for dishes by nutrition preferences (like calories, nutrition tags like Heart Healthy, Paleo, Vegetarian) as well as tastes (cuisine, main ingredient, preparation style). An opportunity to attend the White House’s Champions of Change event in Washington DC. 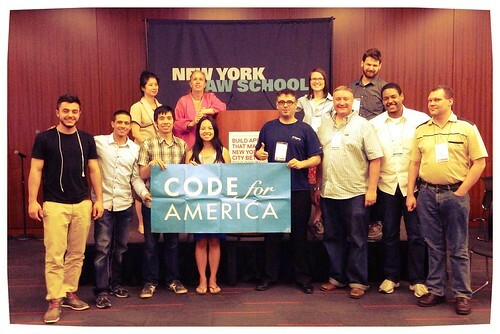 Tickets to Code for America’s Annual Civic Innovation Summit. Tickets to Personal Democracy Forum 2013 Conference. A private dinner with civic technology and civic startup leaders hosted by Code for America. App Description: MintScraps is an online platform that helps restaurants, grocery stores, and other food service establishments track and analyze their waste stream to find cost savings. By understanding the proportion of recyclable and compostable material in their overall waste stream, businesses can take proactive steps in reducing their waste disposal and inventory purchasing costs. Through MintScraps, businesses can manage and analyze their food waste and other parts of their waste stream on a regular basis. Additionally, organic waste haulers can reach out to businesses and collaborate with them to divert their waste away from landfills to save on waste disposal costs. App Description: Plexx is a training center in your pocket. Plexx is a mobile training app where people can learn the skills they need to obtain a job and build a career. A private dinner of civic technology and civic startup leaders hosted by Code for America. App Description: An app to help home owners understand the benefits (lower utility bills, higher property value, greater comfort, healthier, lower carbon footprint) of turning their houses into green homes and the tools to quickly and easily find contractors and green lenders to get the energy efficiency upgrades done. The app would combine location awareness with a simple user path and social sharing capability.